Orchids are widely considered to be the most highly evolved of all flowering plants. What makes something an orchid? Technically, an orchid is a flowering plant that exhibits a unique reproductive strategy. All orchids have both the male and female reproductive structures fused into a single structure commonly called a "column". They also share some other floral characteristics, including (usually) a highly modified petal called a lip, or labellum. It acts as a landing pad for bugs. Even though the reproductive parts are contained in the same structure, orchids have evolved a highly efficient system of insuring that self pollination never takes place. ORCHIDACEAE is a diverse and widespread family of flowering plants with blooms that are often colourful and often fragrant, commonly known as the orchid family. They belong to the family of Monocotyledons. They have, like other Monocots, a single seedling leaf and their floral parts in threes. Orchids are one of the largest families of flowering plants, challenging the daisy or sunflower family, the Asteraceae (Compositae), for the title of the largest of all families. Currently there are known to be 25,000 species of orchids and estimates, based on the current rate at which new species are being discovered and described, suggest that the number may reach 30,000. Orchids are a cosmopolitan family found all the way from within the Arctic Circle to Tierra del Fuego and the islands south of Australia. They are absent only from open water and from true deserts. The smallest orchid is thought to be Bulbophyllum minutissimum which is 3-4 mm tall, but may other orchids approach it in size. The largest orchids are probably vanillas which are lianas that reach into the crowns of rain-forests trees and may be 20m or more in length. Some tropical orchids also form very large clumps on rocks or in trees. Grammatophyllum speciosum plants of several hundred kg have been reported from South-east Asia. Some orchids live on the ground while others grow perched on trees or rocks. Vanilla and some of its allies scramble up shrubs and trees or are lianas that grow up forest trees, using its roots for support. WHAT THEN UNITES THESE DIVERSE PLANTS INTO THE FAMILY CALLED THE ORCHIDACEAE? 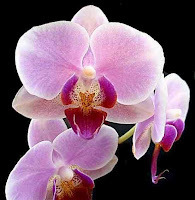 The distinctive features of orchids which separate them from other flowering plants lie primarily in their flowers. All orchids have protocorms, and these are not found in any other family. A protocorm is the structure formed after the germination of the seed and before the development of the seedling plant. The protocorm has no radicle and instead has mycotrophic tissue (and hence differs from other flowering plant seedlings). * The fusion of the male and female organs into a single structure, called the column. * A large number of small seeds per ovary. * Stamens are found on the abaxial side of the flower (the side facing downwards/away from the stem). * The lip/labellum (a modified petal) occurs opposite the fertile stamen(s). * Flowers are often resupinate (have twisted through 180° during development). * Pollen is usually bound together to form large masses (called pollinia).